Embark on a journey to some of Iceland’s most unique attractions in this three-tour combo, showing you the best-loved locations in Iceland while offering a best price and discount to add. See stunning waterfalls, otherworldly geothermal area, black sands and white glaciers on this tour combo. You’ll have the opportunity to visit a 7000-year-old stratovolcano, see a hot spring erupt, hike up a glacier, descend into a lava cave, and discover the hidden spots of the South Coast, all in the course of three days. These tours are a selection of the most popular tours available from Reykjavík, so you’ll be able to keep base in the city and still see all these fantastic sights. You will be picked up in a small and comfortable minibus each morning and whisked away on different adventures before you are dropped off back in the city each night. Your first adventure of three is a tour of the mystical Snæfellsnes peninsula. This area has it all; sandy shores, jagged lava rock formations, stunning waterfalls, imposing cliffs and, of course, a mighty glacier. Next up is the famous Golden Circle; no trip to Iceland is complete without a tour of Þingvellir National Park, Geysir geothermal area and Gullfoss waterfall. You will have plenty of time to marvel at the stunning beauty of these memorable locations before returning to the city. The last tour is action packed; you will travel along Iceland’s South Coast, famed for its wealth of landmarks and diverse scenery. You’ll visit unique waterfalls, hike up a glacier, descend into a lava cave, visit a genuine plane wreck, and unwind in Iceland’s oldest geothermal swimming pool. Don’t miss this fantastic opportunity to see some of the country’s most beautiful attractions. Save a buck by booking these three tours in one go. Check availability by choosing a date. You will have plenty of chances for bathroom breaks and to buy snacks. You can also bring some favourite snacks and beverages. On the first day, you will be picked up in Reykjavík by a small but comfortable minibus. The minibus will give you a personal and serene experience as you’ll travel in a small group without the rush and hassle of the big buses. You will head out north to the Snæfellsnes peninsula, where you will see stretches of lava fields, amazing gorges and waterfalls, lovely villages and a majestic glacier. Snæfellsnes is a historical area, and your guide will fill you in on all of its Viking history and folklores of trolls and elves. You’ll stop at the scenic Kirkjufell waterfall for a chance to take some amazing photos of this picturesque cascade which is situated next to the iconic Kirkjufell mountain. You’ll then head on further into the peninsula where you’ll stop at the pebble beach Djúpalónsandur. On this beach, you can measure your strength using the four ancients lifting stones. These stones were used to measure whether or not young boys were strong enough to become fishermen. You’ll then pass the small fishing village of Arnarstapi where you can admire the charming little houses that overlook the ocean. From there, you'll head on out to the stunning Lóndrangar basalt cliffs, two volcanic rock formations which are said to be a sanctuary for elves, and then to the beach Ytri-Tunga where you might spot a seal or two lounging on the sand. The crown of the peninsula is the 7000-year-old stratovolcano with a glacial cap, Snæfellsjökull glacier. This stunning glacier volcano served as the entrance to the subterranean excursion in Jules Verne’s classic science fiction novel 'Journey to the Centre of the Earth'. You will be given plenty of time to walk around and soak in the beauty of the Snæfellsnes landscape before you head back to your accommodation in the city. This is a new day with new adventures. You’ll be picked up in Reykjavík for a full day minibus tour of the Golden Circle, where you can explore more of Iceland’s mesmerising landscapes. The first stop on the route is the stunning Þingvellir National Park where Iceland’s parliament, Alþingi, was founded over a thousand years ago. The beautiful site is located in a rift valley, between two continental plates. These plates are slowly drifting apart, tearing up the landscape around in the process, causing cracks and canyons that traverse the region. You’ll head further south to the stunning Gullfoss waterfall located in the river Hvítá. Fed by Langjökull, Iceland’s second biggest glacier, Hvítá river rushes 40 kilometres southwards before making a dramatic, two-step plunge into a 32-metre gorge, creating this magnificent cascade. 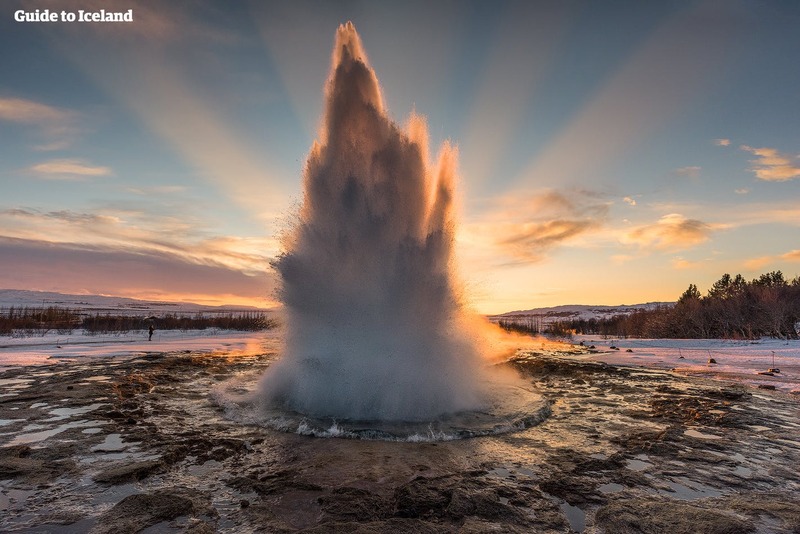 Your last stop is Geysir geothermal area; the home of bubbling mud pools and erupting hot springs. Magma-heated water erupts in a 20-metre high column every 5-10 minutes at Strokkur hot spring, so you’ll have plenty of opportunities to take amazing selfies with this famous water feature. If the weather is in your favour, you might make a couple of more pit stops before heading back to Reykjavík, visiting scenic a serene waterfall and a gorgeous river. Today you’ll be driven along Iceland’s south coast for a day filled with sightseeing and activities. You will be picked up in a minibus from your Reykjavík accommodation in the morning and begin your journey south-east. The first stop of the day will be the unique Seljalandsfoss waterfall. This beautiful cascade is different from others as you will be able to view it from all angles. A pathway leads you behind the cascading water, so you’ll be able to marvel at the surrounding landscape through a veil of falling springwater. Next up is another, equally beautiful waterfall; Skógafoss. This is one of Iceland’s biggest cascades with a width of 25 meters and a 60-metre drop. On sunny days, you might see a double rainbow forming in waterfall’s mist. You will then reach the tongue of Sólheimajökull glacier, where you will partake in a glacier hike. Your expert guide will provide you with all the necessary equipment and knowledge for this incredible adventure. Sólheimajökull is a rugged glacier, riddled with jagged ridges and ashy peaks from centuries of eruptions from nearby volcanoes. Your guide will lead you through this maze of ever-changing ice formations and blue crevasses to a spot where you can relax and enjoy the ethereal landscape of the glacier. After you descend, you’ll board the minibus again and head on out to your next adventure. Depending on the season, you'll either stop at the wreckage of a crashed aircraft in the desolate landscape of Sólheimasandur or visit the black sand beach of Reynisfjara, often considered to be one of the most beautiful places in Iceland. You will then travel to Seljalandslaug swimming pool, Iceland’s oldest geothermal swimming pool. There, you’ll get a chance to unwind after a day of sightseeing and glacier hiking. But before you head on back to Reykjavík, you’ll have one more stop to make. You will get the chance to discover the fascinating world under the surface of Iceland’s lava fields on a cave excursion. All necessary equipment and knowledge will be provided before you’ll descend a cave formed by volcanic forces. Our group was extremely happy that we selected this three-day tour package. The pickup was on time at our hotel each morning. The buses used were comfortable but a bit cramped at times. The guides we had, a different one each day, each brought a different perspective to the areas we visited. The highlights were the glacier walk and the visit to the Seljalandslaug swimming pool. For us, this was the perfect way to see Iceland. I'm really glad I chose this tour. I got to see so many beautiful sights and had the time of my life. Our guide was super helpful and always telling us some stories about Iceland. I highly recommend this tour! Overall good. First two days were good and so were the guides. The 3rd was okay. The Glacier hike was fun, but everything else was dull.